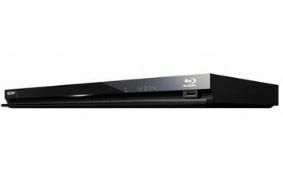 Sony confirms third model in 3D Blu-ray player range | What Hi-Fi? The £200 BDP-S470 sits below the BDP-S570 (£230) and flagship BDP-S770 (£299), out in May and September respectively. The BDP-S470 is 3D-Ready, meaning it will need a software upgrade (available in June) to become fully 3D capable. It's also wireless LAN-ready so can access a wi-fi network using an optional USB dongle, giving access to Sony's Bravia Internet Video service which includes BBC iPlayer support and movie streaming from Lovefilm. One gigabyte of flash memory is included for storage of BD Live content, there's support for DiVX HD and MKV video formats and high-definition audio decoding onboard. Bitstream Dolby TrueHD and DTS-HD Master Audio can be sent directly to an AV amp. The pricier BDP-S570 model has built-in wi-fi as standard and is 3D-capable straight out of the box, without the need for any software upgrade. Both models adopt Sony's new Monolithic Design concept.